Clinical researchers are typically focused on developing new drugs, treatments or diagnostics to treat human disease. They can sometimes be physicians and treat patients, especially if they work at academic medical centers. These researchers understand the disease area they are focused on, and know the landscape of treatments and tests that exist for it. They know about the progression of the disease and see the longitudinal nature of the data that is gathered as a patient goes from diagnosis to treatment to recovery or decline. Clinical researchers will typically want access to clinical data from patients for such purposes as cohort identification. They will also want to look at molecular data such as genotype and gene expression data. However, most likely will want that data to be curated so that only specific features of interest are available, as opposed to whole genome or transcriptome data. Biological researchers concentrate on understanding the underlying processes of life. This can range from the understanding biological processes that are common to all life, such as the regulation of gene expression, to the biology of a specific disease, such as type I diabetes. Another factor that affects the biological researcher persona is the scale at which they operate. Some biological researchers work at a small scale, from the bottom up. They focus on a small number of genes or proteins, perhaps in a specific biological pathway. Other biological researchers work on a large scale, from the top down. For example, they might look at the expression level of all genes to understand the overall biology of a disease. Biological researchers will need to access reference biological data such as the genomes of applicable organisms, including human and mouse. Bottom-up researchers can use whole genome or transcriptome data but will likely only be looking at the data from particular genes or pathways. Top-down researchers will be mining whole genome data sets, although they might collaborate with bioinformatics researchers to take advantage of these large and complex data sets. Informatics is the development and application of computational methods to biological problems. This might involve the analysis of hundreds of genome sequences to look for patterns of mutations, or the comparison of known pathways to gene expression patterns. Either example requires computer software to run complex analyses and then generate reports, or visualizations, to allow the researcher to understand the results. Bioinformatics researchers will need access to large data sets to test and validate their methods. They will often want to download these data sets to their own labs so they can have more control of the programs they run. Statistics is crucial for good biomedical research. Whenever a researcher draws a conclusion from data in front of them, or designs an experiment, they should have an understanding of how likely their results are to be true. Statistics can help researchers detect biases in their data that might confound their results. 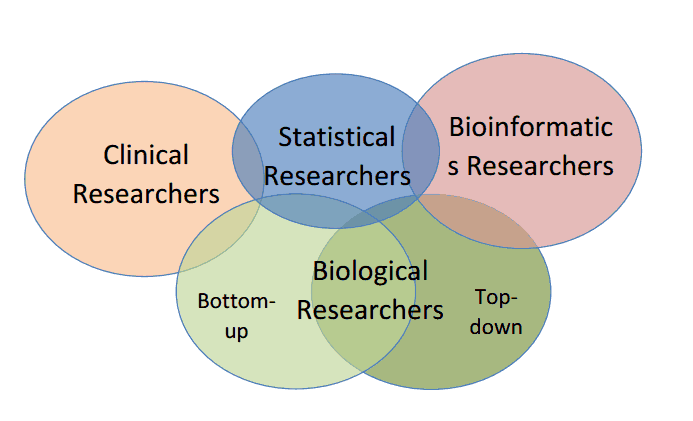 Statisticians are similar to bioinformatics researchers, but if they are working in a clinical domain they will also need access to the same types of data as clinical researchers. These depictions are surely oversimplifications. Depending on the application it might be necessary to describe greater or fewer personas. For instance, clinical researchers could be broken down by disease area and top-down biological researchers could be broken down by their area of focus, such as genetics or proteomics. In the real world these types of researchers often collaborate together. For instance, a clinical researcher in search of a diagnostic biomarker might collaborate with a top-down biologist to generate whole exome sequences and mine that data for potential biomarkers. Processing and analyzing the exome data would likely involve collaboration with a bioinformatics researcher, since that data can be quite large and complex. 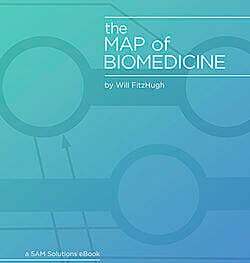 Once biomarker candidates are identified, the clinical researcher might work with a small-scale biologist to understand the biological significance of the biomarker and how this biology might inform the its refinement and diagnostic use. Lastly, all of these researchers might work with a statistician to design their experiment and to ensure that their results are not artifacts or the result of bias. We’d love to hear from you. Do these categories of researchers seem right? Do you see yourself fitting into one or more of them? As biological research focuses on translating biological discoveries into new therapies and diagnostics, more and more work is being done in collaborations between all these kinds of researchers. As tools get developed to share and organize the information from these studies, it’s worth asking whether a single platform to support translational research makes sense. Given the diverse data types and personas involved, it could be a challenge to meet all needs in one system. On the other hand, without such tools, the fragmented nature of biological research data will likely continue. Are you designing an application for a research group and need advice? Get some free advice here.